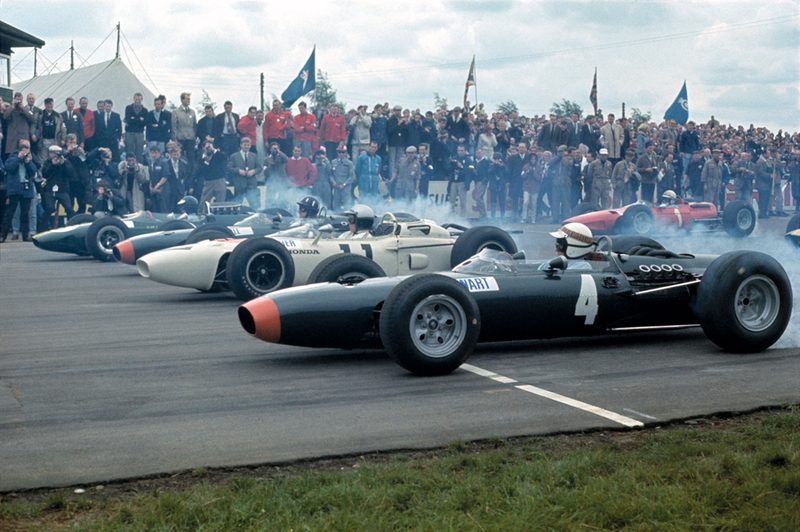 Jim Clark continued his dominance of the season by winning the British Grand Prix at Silverstone for the fourth consecutive time, his fourth championship win in a row. Despite a crash in the first practice session, Clark set the fastest time and started on pole, with Graham Hill and Jackie Stewart alongside him in the BRMs. A surprise package on the front row was Richie Ginther in the Honda, which showed that the Japanese were learning fast and were beginning to develop a car that could challenge for honours in Formula One. Ginther started the quickest and was in the lead going into the first corner, but he was soon overtaken by the sheer power of Clark's Lotus and, once in front, Clark steadily pulled away from the field. After staying in the mix for the first quarter of the race, Ginther's Honda developed fuel injection problems and retired on the 26th lap, but the Japanese newcomer was definitely improving. After 50 laps, Clark was over 30 seconds ahead of Hill and it looked like it would be another routine flag to flag victory. But then his Lotus began to misfire and Clark realised that it was burning oil at an alarming rate. As he battled to preserve his engine, it gave Hill the chance to try and catch up, although his BRM was suffering with brake problems. Gradually Hill ate into Clark's lead, and with only two laps to go he was only eight seconds adrift. Hill threw caution to the wind and pushed the BRM to its limits, shattering the lap record in the process. Entering the last lap the gap was down to five seconds, but Clark just managed to hold on, despite Hill's valiant effort, eventually winning by only 100 yards and three seconds. To save his engine, Clark had coasted round the corners in neutral and battled with the higher gears on the straight parts of the track. "In the last two laps when my engine was showing no oil pressure at all", he said, "I would have been prepared to risk 'blowing up' rather than see Graham pass me in the BRM. Fortunately it was not necessary." Hill added; "I would not have allowed Jim to get so far in front had I not suffered with brake trouble." Following the race, the RAC awarded Clark and Lotus boss Colin Chapman special gold medals in honour of their remarkable achievements in the past four British Grands Prix. Clark was now leading the championship by 13 points from Hill.